If yesterday was all beauty and calm, today was crowded and frenetic. 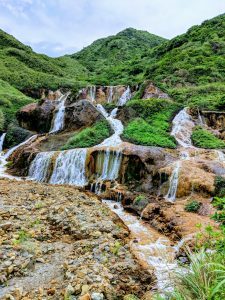 We hired a local driver to take us out of Taipei and see some of the surrounding sites. We were not alone. First stop was the Yehliu Geopark. This poor headland has some weathered sandstone rocks on it. If you squint and turn your head sideways you can sort of see some animals in them. In a triumph of entrepreneurship someone fenced the headland off and charges for entrance. And the crowds flock in. There must have been a couple of thousand people there when we visited; there was a shuffling conga line moving around and actual queues to take selfies. The overcrowding was clearly not unusual because there were concrete replicas of some of the rocks available for selfies without queuing to get to the real one. We, as you might have guessed, hated it. 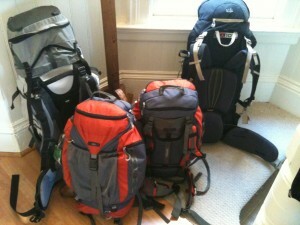 Luckily our second stop was not crowded and also could not really fail to please. The Yannick Cake Shop is locally famous for its quality cakes made with fresh ingredients. We all chose a cake and then sat by the East Chine Sea to eat them. Very nice. Onwards to YinYang Sea. There’s an old gold mining area, now played out, where the rivers pick up iron and pyrite as they flow through the hills. By the time they flow into the sea, the river is a deep yellowy gold colour and creates a distinct line against the blue sea. The two sides to the sea lead to he Ying Yang name. Bruce, our driver, had gathered that we were not enthusiastic about the crowds of tourists. He explained that it was the community holiday season where towns around Taiwan go on a coach holiday together. That explained the industrial quantities of coaches we were seeing. Anyway, we adjusted the itinerary and he took us to see an old WW2 Japanese prison camp. Although there wasn’t a huge amount to see the list of prisoners and the description of the privations they endured was poignant. Back on the tourist trail we visited the gold waterfall – here the iron and pyrite have coloured the rocks a vague gold. Then on to Jiufen Old Street. Jiufen is a major tourist destination but it was pretty much like a charmless night market during the day. Crowds shuffled along buying tourist-tat and munching on sausages on sticks or, god help us, Stinky Tofu. We had lunch and did the obligatory shuffle down the street. The view at the end when you pop out and can see the coats is a stunner, marred by the fact the viewpoint seems to be the only place you can smoke for miles around. Really Jiufen is not an experience I’d recommend. It’s OK though, things got better. Our second last stop was the Shifen Falls. This is a very pretty set of waterfalls near the town of Shifen. The falls are almost a perfect semi-circle and drop probably 20 metres into a deep pool. Our sky lantern achieved lift-off. Shifen used to be a coal mining town but now has one real claim to fame. It is the place you come to release a sky lantern. 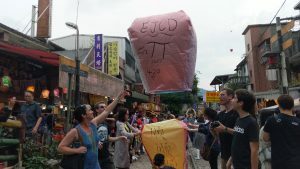 The sky lanterns are large paper balloon – large as in about 4 feet tall. You buy a lantern – choosing colours that have an assigned meaning such as good exam results, promotion, success, and so on – and then write on the sides. When the locals write on the lanterns in Chinese characters they could be writing the most banal stuff and it looks great. Our efforts were poor by comparison, but it was a fun effort. Once decoration is complete a wad of flammable paper is inserted into the open base of the lantern. You go outside and join the crowds standing on the train tracks that run through the town; keeping a weather eye out of the local train that still uses the track several times an hour. The the paper is lit and the lift begins. It’s quite astonishing how much lifting power is generated. Our lantern joined many others gently floating up into the evening sky and over the surrounding hills. 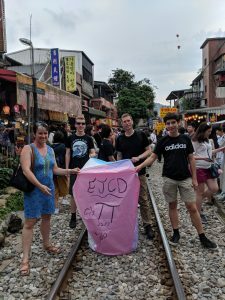 Although today wasn’t our best, the sky lanterns were a nice way to finish the day and our time in Taiwan. Our sky lantern takes flight.